Today's hot news comes from Chris Cecil-Wright at Edmiston & Company as he tells me that the sale of his central listing, Alloy's 51.7m flybridge sailing yacht Kokomo, was completed today with Antoine Larricq at Fraser Yachts acting for the buyer. 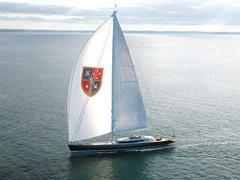 This marks the fifth Alloy superyacht sold by Fraser in 2009 - a notable coup. Built in aluminium by the respected New Zealand yard in 2006, to Lloyds class and MCA compliant, Kokomo accommodates 10 guests in a master, two doubles and two twins and has been renamed Konkordia. The asking price was €28 million.